- Main: 8" x 5" x 3"
- Frontal: 6" x 4" x 1"
- Sides: 5" x 1.5" x 1"
The Thermite has one main compartment equipped with a water-resistant storm collar which can be cinched closed and a zippered frontal compartment for PDA and other accessories. An integral sheath with adjustable lid on each side allows for immediate access to two important tools of choice, e.g. flashlight and extra mags. 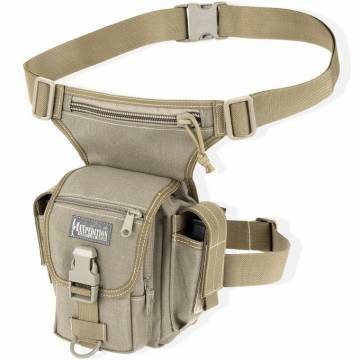 MAXPEDITION has increased the elasticity and comfort of the removable leg strap and has upgraded the rear mesh cover to a 4-layer high-breathability sandwich material for cooler extended wear. All Thermite Versipacks are also now ambidextrous!